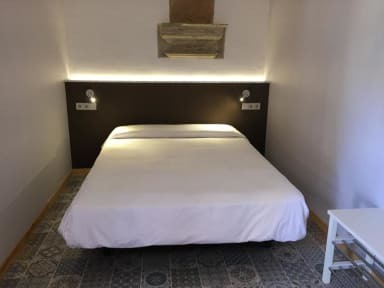 BCN Home Guest House, Barcelona, Hiszpania : Rezerwuj teraz! BCN Home is located on the first floor of a cool classic residential apartment building in Barcelona’s hip Raval district, and it will make you feel at home - Barcelona style, with nice decoration and good facilities. It features double rooms and ensuite bathrooms, mosaic tiled floors - typical of the neighborhood, and an outdoor verdant terrace where you can rest after a long day of exploring the city. BCN Home offers 3 types of room: Superior Double rooms, Standard Double rooms, and Shared Bathroom rooms. All rooms have WiFi, a TV, and cool/warm air conditioning. All rooms include bed linen, towels, and comfortable queen size beds. Great location, in the center of town, only 5 minutes from Las Ramblas. BCN Home is situated at a quiet, tree-lined street within the bustling historic center. You will be close to all the action, but will also be able to enjoy the peace and comfort of home at the end of the day. Check in is from 12:00 to 23:00. Check out is before 11:00. Payment on arrival in cash, or by credit or debit cards. Taxes not included - occupancy tax 0.75 EUR per person per night.